This was the very first Star Trek convention I ever attended. I have to confess, I had my misgivings about going, laboring under certain preconceptions of what to expect from a Star Trek convention. I credit the wonderful accounts written by other ORACLE members of their experiences at past ST cons with bolstering my courage about attending one myself. I arrived at the hotel on Friday afternoon and, far from my nightmares of being accosted by a hoard of marauding Klingons in the hotel lobby, there was, in fact, no visual evidence that a con was even taking place. It wasn’t until Friday evening that events got rolling. By then the vendor booths had been set up and an informal get-together/cocktail party organized. While in the registration line, I found myself chatting with some other, more seasoned, conventioneers, who informed me that this con was on the small side. They related their experiences at another con they had recently attended that featured the “heavy hitters”–namely, Shatner and Nimoy–and the way the actors’ handlers protected them from their fans. I’m glad my first experience with a Star Trek con was a smaller, more intimate and informal gathering. I spent Saturday morning attending some of the seminars offered by the con. Of particular interest was a discussion on the future of Star Trek as embodied by the motion picture expected to be out sometime in 2008. This “prequel” will evidently chronicle the lives of a young Kirk, Spock, and company. The general attitude of both the presenters and the audience was one of cautious suspicion. I got the impression that there wasn’t a lot of confidence that the makers of the film would “do right” by Star Trek. Given the emotional investment of fans in the franchise, the future of Star Trek rides in large part on the success of this film enterprise, and I got the sense that there’s quite a bit of concern that the movie won’t live up to the hallowed standards of “good” Star Trek fare. While discussing the whole chronology of the Star Trek feature films, there was almost universal agreement among the audience members that TPTB lost a wonderful opportunity when they elected not to follow up on DS9 with a movie–something I think all of us would agree with. René’s convention Q&A presentation lasted an hour. I didn’t take notes, but he was very patient answering questions I’m sure he’s been asked hundreds of times before. However, there was one question he “didn’t” answer. He was asked if there was an episode or scene on DS9 that made him cringe. He talked around the question for some time and eventually wound up answering for Nana (describing her being enveloped by the crystal in “Heart of Stone”). More on that later. Saturday evening, René and Nana performed Love Letters. Since the venue for this presentation wasn’t a proper stage, they asked for our indulgence, given the lack of stage lighting and the usual theatrical setup. I don’t think it mattered. All I can say is—WOW! Powerful, emotionally charged, and tragically poignant at the end. René and Nana seem to have such chemistry between them, the way they feed off each other. I was astonished that, for such a sedentary piece (they are both seated the entire time), so much vitality and intensity were conveyed through looks, voices, and subtle body movement. There was also an intimacy between the characters, and I wonder if this was magnified because of their close proximity to each other, given that they were sitting next to each other at a single table. I’ve read that when they’ve done this at other cons, they have been seated at separate desks. There’s nothing like a live performance, especially when the actors are as gifted as these two. It was a joy to be there and share that experience. René left on Sunday morning, but I decided to stay for Nana’s presentation, which was delightful. Nana seems to really enjoy these interactions with her fans. I learned that Nana coveted the role of Janeway and claimed she couldn’t understand why TPTB wouldn’t let her play Voyager’s captain along with her role of Major Kira! I don’t remember all the questions she was asked, but someone followed up on the question that René had been asked on Saturday, and she confirmed that the “Heart of Stone” episode did, indeed, make her cringe. Then she answered the question for René, recalling a scene from Season One’s “Captive Pursuit.” Amid a pyrotechnics display designed to simulate phaser fire, Odo had to drag Kira out of danger. In doing so, he grabbed her at the most convenient–and inappropriate–place. René was evidently mortified, but as Nana said, “No harm, no foul!” By the way, the scene made it into the final aired episode, if you want to take a look. As I had a 700+ mile drive home, I left soon after Nana’s presentation was finished, so I said hurried good-byes to the folks I met at the con. It was a truly wonderful weekend, and I am so glad I decided to attend. 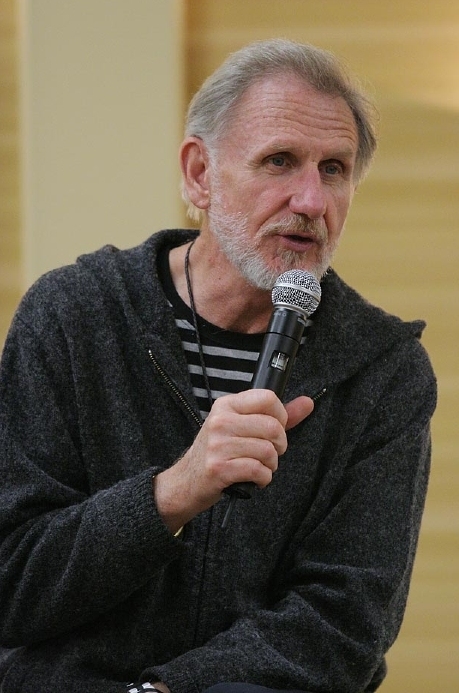 I was one of the lucky people in the audience when René Auberjonois and Nana Visitor performed Love Letters at Vulkon’s Cleveland convention in October 2007. I had not planned to attend, but at the last minute I decided that I could not miss the opportunity to see René and Nana perform Love Letters live. So my friend, J, and I did a 36-hour flyby. My trip started in Maine, then I flew to NYC to meet J, then we drove to Cleveland. (Yes, we are nuts!) The weather was crappy for most of the trip, so it took us a bit longer than anticipated to find the hotel. However, the company was good and the conversation was lively. We arrived at the hotel around 10 pm Friday night. After an uneventful check-in (yeah! ), we found our room. Before J and I crashed, I called Marguerite to let her know that I had arrived alive. Saturday morning we got up early to register. While waiting in line, I saw who I thought was Marguerite. It’s so much fun meeting fellow fans, especially those you have been emailing for a couple of years. Afterwards, J and I headed into Cleveland for breakfast at a little café J had read about online. After a few wrong turns, we found the café. There was a line but thankfully not a long one. I was ready to snack on my own arm. LOL. But it was worth it. The omelet was delicious, but the strawberry cream stuffed pancakes were over the top, mouthwateringly scrumptious. Yummo! Once we had stuffed ourselves to overflowing, we were back in the car heading for the hotel. The ORACLE gang was getting together with René to chat and catch-up and I didn’t want to miss it. We discussed all sorts of things from the upcoming (at that time) writer’s strike to where René was when the US first landed on the moon. I even got to show off some of my pictures from South Africa. The photo op with René and Nana was next. It’s hard for me to believe, but that was my first photo with both Nana and René. Can I just say how pleased I am that it turned out okay?!? Nana keeps getting more gorgeous as she gets older. It’s very annoying to the rest of us! What makes it worse is that she is so darned nice. You just can’t hate her for being beautiful! René’s Q&A was after the photo ops, so I met up with J and we found our seats. I wish I could tell you what René talked about, but I am terrible with those kinds of details. I should take notes, but I prefer taking photos. 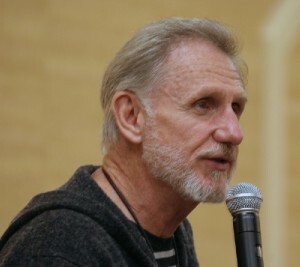 I know René discussed returning to Boston Legal, Nana’s least favorite DS9 episode (he couldn’t think of one for himself), the play he will be doing with his daughter this summer, and lots more that I can’t remember. I took lots of pictures. But since I forgot to reset the camera after South Africa, they aren’t as good as I had hoped. (I blame my memory lapse on lack of sleep.) René was interesting and articulate. René’s autographs followed the Q&A. Marguerite was there with the ORACLE table ready to take donations for Doctors Without Borders. There were lots of fun things available for René to sign. Since I already had an Odo’s Bucket, I opted to get Chief Louie cartoons. You know, I don’t remember what I said to René–probably something inane. Before I discuss the play, I would like to mention that René brought several one-of-a-kind still photos from DS9 that he and Nana autographed. Those were for sale with proceeds going to Doctors Without Borders. I was able to snag a photo of Odo and Kira from “Children of Time.” René told us his fans had raised $1,400.00 for the charity. Go us!! There was a brief break after the Q & A, then it was back in line for Love Letters. I don’t care what else René and Nana do or how many years pass between collaborations; those two continue to have amazing on-stage chemistry. Sitting side by side, René and Nana read a life time of letters written between Andrew Ladd III and Melissa Gardner. From 8-year-old Andy’s first letter to Melissa accepting her invitation to a party, to his last letter to her mother, René and Nana had us. They took us into the lives of Andy and Melissa. With just their voices and their body language, they made us care about those two flawed people. At the end, we cried with them as Andy read his last letter. Sitting at a standard-issue hotel table on a typical convention stage just outside of Cleveland, Ohio, they created magic. The surroundings didn’t matter because they took us away with them into their characters’ hearts; their humor, their heartbreaks, their dreams. We packed quickly, ate, and hit the road for NYC that night. J had to work Sunday and I had to get home. If you have the opportunity to see these two wonderful actors, take it, even if you have to be a little crazy, because some things are worth being crazy for. You won’t regret it–guaranteed. To tell you the truth, lots of my friends and relatives can’t understand why I bother to go to Star Trek conventions. A few, it’s true, don’t understand the appeal of Star Trek at all. For them, conventions are just one more part of all the unfathomable “science fiction nonsense” that has engaged my interest and “distracted me from more important things” my whole life. However, most of the people I know have at least a general fondness for Trek, and quite a few are serious fans; they can talk knowledgeably about various episodes and large-scale themes and their favorite characters, and more than a few of them are fanfic writers (darn good ones, too). But even among my friends who freely admit their abiding interest in Star Trek, most don’t see the appeal of conventions…. and certainly don’t see why anyone would want to go to more than one of them. I have to admit, that last group has a point. Star Trek conventions have settled into a pretty fixed pattern over the years. There’s always a dealer’s room full of people selling t-shirts and action figures and photographs and other stuff. There’s always a place where you can sit and listen to actors or other people associated with the shows talk about their experiences and answer questions from the fans. And there is always time spent waiting in lines: a line at the registration table, a line if you want an autograph, a line to have your photo taken, a line to get into the hotel dining room or the Denny’s across the street. Despite all this, though, it’s been my experience that, beneath this same-old same-old surface layer, no two conventions are the same. And it’s the differences I find from one con to the next—some subtle, some significant—that keep things interesting for me, and keep me looking forward to the next one. So, what made the 2007 Cleveland Vulkon different and special? For one thing, René’s appearance at this con was a long-awaited moment for the Vulkon organizers, who had originally invited him to appear at their convention in Orlando, Florida in October 2006. However, a last-minute change in his Boston Legal shooting schedule forced René to miss that convention. A few of us from ORACLE went to that Orlando convention anyway, and the Vulkon staff generously allowed us to set up a charity fundraising table for the weekend, where we raised a nice sum of money for Doctors Without Borders by selling some of René’s already-signed photos. In Cleveland, René’s first scheduled event was his 3:00 p.m. Q&A session in the main ballroom. René’s autograph session was scheduled to begin immediately after the Q&A session, at 4:00 p.m., at a table right next to the stage, and the Vulkon people were very agreeable about René selling his own items for charity at his autograph table. So, during René’s talk, I quietly laid out all of our ORACLE supplies. When he finished his Q&A, René stepped off the stage, took his seat at the table, and over the next hour the Vulkon staff efficiently guided all of the fans through the line. And, as happens at most Trek conventions, the fans were incredibly generous: even though it was a small crowd, people donated over $1,000 in exchange for the various photos and cartoons that René signed for them. After a short break, and a photo op for fans who wanted their picture taken with René and Nana together, it was time for Love Letters. Before beginning the play, René and Nana each said a few words about the magic of live theatre. Then René explained that he’d brought some one-of-a-kind photos, and wasn’t going to make a big fuss about them or do an auction, but if anyone was interested they could talk to me about them during intermission. Then he took his seat at the table next to Nana, there was a moment of silence…. then René read the title, Love Letters, and they began. Mary and Ginger described (above) how marvelous the play was, and the wonderful chemistry between Nana and René. Throughout the performance, they had the audience’s complete attention, to the point that people were literally leaning forward in their chairs, totally engrossed in the action of the story. At intermission, René and Nana rose from their places, stepped down from the low stage, and left the room. As soon as they were gone, I went to stand near the stage with the photos René had brought and was immediately surrounded by a crowd of interested people, and within two or three minutes every photo had been claimed. A very successful endeavor! When I added that money to what we had collected during the day, the grand total for the convention was $1,400. The second half of the play brought possibly the biggest laugh of the whole evening—when René’s character, Andy, writes a painfully trite and smug Christmas letter—as well as the deepest sorrow. As Nana performed some of her character Melissa’s final lines of the play, she began to cry…. and then René’s voice broke more than once as Andy read his final letter. I’m not sure if every single person in that room was in tears by the end of the performance, but if not, it was close! When the play was finished, Nana and René took their bows, and Sue presented a bouquet of flowers to Nana. After they made their exit, the Vulkon master of ceremonies took the microphone and said, “Wow. Wasn’t that great? I don’t know about the rest of you, but after that, I need a drink!” And with that, he led the audience out into the corridor and over to the adjacent ballroom, where the evening’s cocktail party and dinner, featuring Nana and René as guests, was already set up. On Sunday, I met up with the rest of the ORACLE folks in the ballroom around noon for Nana’s autograph session and Q&A presentation. We enjoyed listening to Nana who, among other things, answered the “cringeworthy” question for René. Afterward, a few of us ORACLE folks hung around the hotel lobby and chatted a while longer, until it was time to leave for the airport. So, that’s my story of the October 2007 Cleveland Vulkon. Yes, it had similarities to other conventions…. but it was also very much a unique experience, and worth every minute we spent there, for the sake of all of the time and enjoyable conversation that René so generously shared with us, for the chance to be part of René’s charity fundraising efforts, for the fun of getting together with new and old friends from ORACLE, for the pleasure of hearing new stories from René and Nana during their Q&A sessions (not to mention a few interesting variations on old stories), and for the powerful, deeply moving performance of Love Letters. As Ginger says, even if going to conventions seems a little crazy, some things are worth being crazy for!